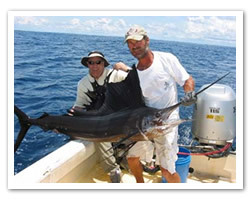 Various companies offer different sport fishing packages that can be arranged for you upon request. Most include a 25 foot boat, for 8 persons: 6 fishermen (passengers) and two crewmembers: the captain and a guide, lifejackets for everyone, roof (to protect from the sun) and for more safety, two motors. Departure is usually from Piñuelas Beach in the Ballena Marine National Park. There are whole day and half day tours available. Occasional observation of whales, dolphins and turtles. Entrance fees to the Park are included. The South Pacific waters of Costa Rica are well known for having possibly the best game sports fishing areas due to its location. Most of the big rivers drain into the ocean bringing a lot of feeding material for the many species of in-shore and off-shore fish. The irregular ocean floor around these areas make it an ideal place for the different species to use this area as mating and nursing grounds, but more importantly, as feeding grounds. The strong currents and shallow decks of the geological plates here make it a paradise for a great catch. Most fishing tours start at around 6 AM from Piñuelas Beach and most last around 8 hours. The fishing hot spots such as shoals (banks) are about 27 miles out to sea. Trolling or with bait you can find red snapper, yellow-finned tuna, jacks, sea bass, mahi-mahi, mackerels, and many more. Up to 6 persons (3 rods fishing per person). Half day: 7:00AM to 11:00AM or 1:00PM to 5:00PM. 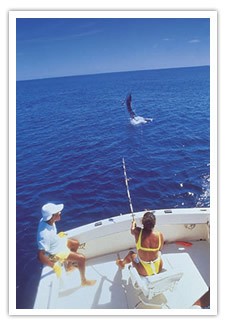 Full Day Sport fishing tour: 7:00AM to 4:00PM (light lunch included). 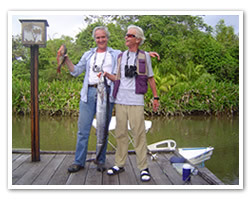 In Mar y Selva we will be arranging everything for you to enjoy the best Costa Rica Sportfishing.